Are you about to rock? 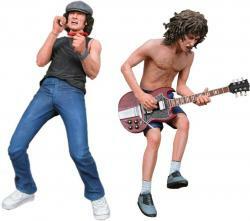 This 2 figure set of Angus Young and Brian Johnson from AC/DC will inspire you to rock! From the classic album and video For Those About to Rock comes this great item, complete with guitar, microphone and display bases. The kings of hard rock for more than 30 years, AC/DC has one of the best selling albums of all time and over 15 albums under their belts. NECA immortalizes legendary vocalist Brian Johnson and guitar god Angus Young in plastic in an action figure two-pack. Capturing lead singer since 1980, Brian Johnson, and full-fledged guitar god Angus Young as they appeared during their Back in Black era, the AC/DC Action Figure 2-Pack from NECA is a hard rock fan’s dream come true. Brian Johnson stands poised for a trademark wail with detachable microphone in hand. Angus, of course, comes with his trademark guitar and sculpted in a classic “Angus” pose. Both figures come with black bases for home display. Comes complete with guitar, microphone, and display stands for each figure. Click the button below to add the AC/DC 2-PK 7'' ACTION FIGURES to your wish list.